Barbara Hill presents Mike Null (left) of the Gallipolis Fire Department and Jeremy Bryant (right) of the Point Pleasant Fire Department, with donations for Fire Prevention Week. Both departments are visiting schools this week to educate children on fire safety. OHIO VALLEY — A local woman is honoring the memory of her grandson by raising funds for charities. Barbara Hill recently made three donations that will have an impact on children and families in Gallia and Mason counties. 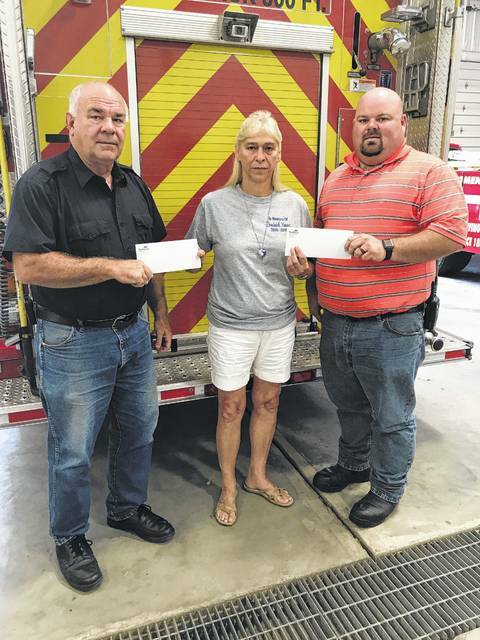 The Gallipolis and Point Pleasant fire departments both received $600 to support their fire prevention programs. These programs allow firefighters to go out into schools to teach students about fire safety and what to do in an emergency. Through programs like these, a child’s life could be saved by training them how to react in a fire. Hill’s grandson, Dominick Young, passed away in a fire on Aug. 21 of last year in Mason County. Young was almost 11 years old. Both the Point Pleasant and Gallipolis fire departments responded to the fire that day. Almost a year later, Hall organized a poker run to raise money in the boy’s memory, raising over $2,000. Hill also donated $1,100 to the Snack Pack Program of Gallia County which gives out food to over 700 students in Gallia County each month. Hill hopes to grow the poker run and continue giving to charities that help kids. Fire Prevention Week activities are also taking place this week in schools throughout the area. Both departments take their respective fire prevention programs very seriously as they know that the tips they teach children even at a very young age can save their life when an emergency strikes. Both fire departments teach kids the importance of smoke detectors and changing their batteries, they teach the importance of having an exit plan to get out of each room in the home, how and when to stop drop and roll and many other important safety tips. Point Pleasant Fire Department Chief Jeremy Bryant contributed to this article.